Britain's Jess Learmonth finished second at the World Triathlon Series opener in Abu Dhabi as the Netherlands' Rachel Klamer won gold. South Africa's Natalie Van Coevorden took bronze as several athletes, including world champion Flora Duffy, crashed out in the wet conditions on the sprint-distance course. "It was carnage," said Learmonth, 29. Britain's Jonathan Brownlee also crashed on the bike leg before finishing seventh in the men's race. Victory marked Klamer's first WTS title, while European champion Learmonth now has three podium finishes having won silver and bronze in Stockholm and Rotterdam respectively last year. "I'm really pleased. I've done well here but there is still a month to go until the Commonwealth Games," said Learmonth. "It gives me a bit of confidence and we'll have to see what it brings." 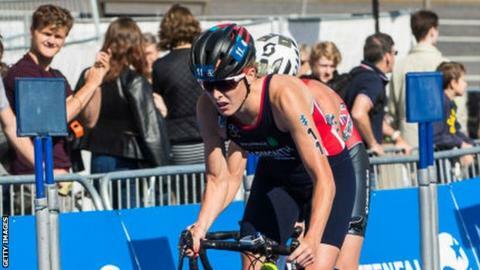 Compatriots Vicki Holland finished 11th, former world champion Non Stanford 16th and Sophie Coldwell 26th. In the men's race, South Africa's Henri Schoeman, Olympic bronze medallist in Rio, dominated to clinch his second WTS victory having last won in Cozumel, Mexico, in 2016. Spain's defending world champion Mario Mola took silver while Frenchman Vincent Luis won bronze. "It's so good to make a statement," said 26-year-old Schoeman. "I'm just so happy. I've had a tough year after the Olympics and it's so good to come back." Brownlee - racing in Abu Dhabi for the first time since 2015 - led in the early stages of the bike leg before sliding off on the slick roads after only 3km. The 27-year-old quickly remounted but could not make up the ground, finishing 53 seconds behind Schoeman in a race which consisted of a 750m swim, 20km cycle and 10km run. Britain's Tom Bishop, who finished second in Abu Dhabi last year, was 14th, while Marc Austin and Gordon Benson were 27th and 46th respectively. Schoeman becomes only the second athlete in WTS history to lead out of the swim and off the bike before winning the race. Britain's double Olympic champion Alistair Brownlee - absent in Abu Dhabi through injury - was the first in Kitzbuhel, in 2011. BBC Breakfast presenter Louise Minchin, former GB triathlete Annie Emmerson (with the help of some special guests) mentor three beginners aiming to complete their first triathlons in June 2019. BBC coverage times, race schedule and GB competitors for the 2019 World Triathlon series, featuring defending world champion Vicky Holland. This blend of swimming, cycling and running is one of the toughest tests in sport - here's how to get involved and find a local club.